We’re sharing 4 easy crafts to pick & choose from for beach lovers! With the holidays coming up and you’re searching for that perfect gift idea, it’s always fun to make a DIY gift for someone! 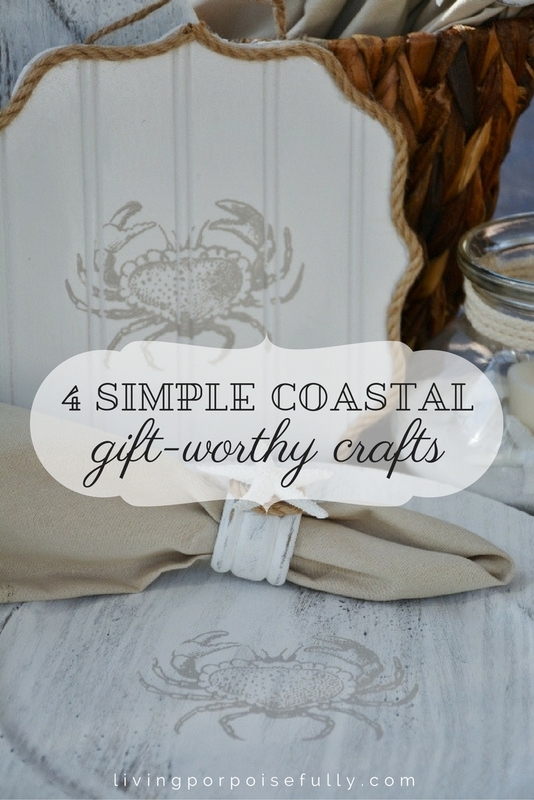 If you’ve got a beach addict in your life (or two or three), you can’t go wrong with these simple & chic coastal DIY gifts. The handmade aspect makes it especially unique and lovely, and you’ll get to enjoy a fun crafting adventure too. Here they are, we hope the ideas inspire you! Once dry, use a cloth to wipe the charger clean. Then use a clean cloth to apply a crème wax or spray it with an acrylic clear-coat to seal. Just to help protect the design! Complete the gift with a set of napkins if you choose! This one is too easy. Just add sand, faux sea stars, and a candle to a rope lantern. Click here for the details! They’re all easy to make, you can mix and match, and even add sea salt chocolates or a sea salt body scrub to make it extra luxurious. We hope you enjoyed the crafty coastal ideas. Above all, keep it simple, fun, and joyful! Fantastic! I just got a new dining room table. These little projects will be perfect for my nautical theme. Just hope I get them finished before the holidays. I also love how simple these projects are . Oh how perfect! We’re so glad the ideas have inspired you 🙂 Enjoy and have fun making them for your beautiful new dining room!